Andre Mina is a Toronto-based record producer, composer and a talented pianist. He started his artistic career by studying at the Royal Academy followed by the Conservatory of music; he then continued his studies by being a part of the Regional Arts Program at Cawthra Park; finally, he graduated with a Bachelor of Music degree from the University of Toronto. Through his career, he trained at Robeter productions studio, where he also works as a session pianist/keyboard player. He has also worked with record labels such as ZEDD records in Toronto and Awakening records in the United Kingdom. This contributed to his experience and knowledge of the music industry. Andre has always shown an eagerness to hone his musical and technical talents. Andre has been taught by Canada’s leading composers such as Gary Kulesha, John Kruspe and Christos Hatzis. Furthermore, he has always established a unique sound as a pianist; he was taught by Marcelle Matta, Mia Bach and Brian McDonagh. He is a self-taught jazz pianist as well, and has been a member of the Dave Neil ensemble in 2009 - 2010; this gave him the opportunity to gain experience in accompanying many artists in both concert settings and recording. 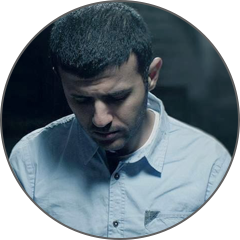 Andre started his professional musical career as a producer at the age of 16 when he produced his first published songs for the Egyptian singer Hamza Namira with Awakening Records Label. Since then, he has been dedicated to learning the craft of music production and sound engineering, he focused on pop, jazz, RnB, and orchestral work. While working with Toronto-based artists, he produced quality records such as ‘Hush’ for Claire Hunter, “Always Let you down” for John Banks, “Who Can I Turn To” and “More Than Passion” for the XM Radio host Ward Anderson, and many other songs for numerous local and overseas artists. Andre has shown his talent over and over again while he worked at Devine Productions producing and composing songs for a number of artists and bands, he also works regularly on projects with “One Roof” studio, while also running his own studio “Minaphonics”. 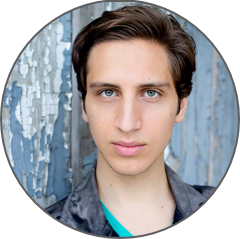 Andre also has shown a great interest in vocal education where he gained 8 years of choir experience practicing with Doreen Rao, Mark Vuorinen, Hilary Apfelstadt and David Holler. This experience has given him the opportunity to learn breathing techniques as well as the principles of vocal techniques. This has given him new insights into songwriting and music arrangement. His experience with choirs has also provided him with the ability to accompany the “Ritz” choir of 400 voices on piano, and work with conductor Bob Anderson in season 2007-2009. And later be a part of performances with the Toronto Symphony Orchestra (TSO) at Roy Thomson Hall with MacMillan Singers. Andre Mina has dedicated his life to his music; he has shown great talent at a very young age and has always worked hard at refining this talent. He has shown dedication and commitment to his career and his clients and has always put great value to his work. Through his creativity, he has impressed and inspired his clients with his skill and knowledge of the music trade as well as his ability to always incorporate original musical ideas into his productions, as well as bringing a unique approach to each song. Andre Mina is the producer every singer wants. He's an instrumentalist on one hand, and a recording genius on the other. He's got an ear for things only the best producers pick up on. And, on top of that, he's a treat to work with. Always great just being in the studio with Andre. Andre Mina's musical arranging skills truly set him apart from the rest of the "producers" out there - this guy really knows his stuff. It's no wonder Andre's artists have had success on Canadian radio - he's someone to watch out for! Andre Mina is definitely a rare gem when it comes to producers! Having had a chance meeting with Andre I discovered that he had done some work on a track of mine. Being happy with what he had added to my song, I decided to undertake a project with him. Together we created a fantastic medley of current songs put together with an original flare. This one project has since turned into 3 projects with more to be done in the future. What makes working with Andre such a joy is that his super talent is overshadowed by his warm welcoming down to earth demeanor. He Instantly makes you feel at home. His creative ability and his great attention to detail make him a producer on the rise, not only can he create the perfect sound that you are looking for he can take your project from start to finish with ease! His super talent and personality definitely make him a producer on the rise!" Look out world Andre Mina is ready to happen!! Working with Andre has been a really cool experience, I've had couple sessions with him and my band Earthphonics and the chemistry was great. His studio setup and placement is a really relaxed but professional environment and makes you feel like something special is about to come out from this session. The fact that he produces and has high quality equipment is a added plus, so all in all I would recommend Andre to any established or new artist in the industry for there production needs. High Park Society has produced the last two singles - Indecision and When Bowie Died - with Andre Mina. His touch on the mix and master of these songs really helps bring them to life. He's great to work with, always very professional, and a vital member of the team. Looking forward to producing more music with Andre. Andre is an incredible musician and producer. I have the utmost respect for his talent and abilities but even more so for his kindness and work ethic. I absolutely love working with Andre in the studio. He is extremely easy to communicate ideas with and since he is extremely knowledgeable in the studio, he really allows me, as the artist, to remain in my creative space while he takes care of all the technical elements of recording. His sincerity in really wanting to help make the best music possible is something I respect and look for in the people I work with. I truly feel that when I am in studio with Andre, I can feel his passion and excitement for music and that really drives the session to great heights. His passion mixed with his attention to detail, truly helps the tracks come to life and sound great. I always feel like he has the ability to draw the emotion needed for the music if he isn't hearing it. On the other hand, his knowledge helps draw out the much needed technical aspects of the music. I am very thankful to be able to work with Andre and am looking forward to creating more beautiful music with him. My experience working with Andre who is nothing but extreme pleasure.Andre's level of expertise in the field of music is astonishing the way he guided me through all of the tracks we recorded together and the final mixed and mastered tracks, came out to be above and beyond of what I expected.I love the fact that working with Andre, I am never rushed through anything I always get to the point where I am happy with what I have recorded.I also want to add that the feedback I get from people about the projects that I finish with Andre is amazing and makes me want to take up new projects over again. Amazing work Andre! Andre Mina is a very thoughtful and well-trained musician. I have had the pleasure of working with him in a number of choirs as his director and I have always been impressed by his professionalism and high musical standards. He is very creative and amazing to work with! Andre is a talented producer, his musical knowledge and attention to details has been helpful in the studio; especially with vocal processing and tweaking. I worked with Andre on a commercial radio single that is currently being considered for FACTOR Canada funding. I found his studio to be a very professional, yet relaxed environment, and his passion for getting the best takes enhanced our creative process. I also enjoyed the way he orchestrated the session from the control room using a camera / screen, and enabled us to capture candid photos and videos of each session. Andre always found a way to accommodate each request or revision and as a result I was very pleased with the outcome of our work together. Andre had contributed in many of my songs which vary widely in music styles and genres, and I can say confidently that he took all of them to the next level...he is a multi-talented musician, hiring him as a producer, arranger or Piano/Keyboard player is always my perfect choice! I met Andre when he was in high school and his musical skills were mind blowing at a very young age, and in the last few years I worked with him on a couple of projects which is always a great experience. He surprised me with his great skills, and I love the way he talks with people, very humble down to earth person. Andre has had a profound impact on me as a producer, teacher and a friend. His influence ranged from my way of hearing music, singing other's cover songs to my general taste in music. Andre was the first producer I'd see on a regular basis. He guided me through my first experiences in the recording studio and taught me the basic 1,2,3's of working inside the recording studio. As a producer he taught me invaluable lessons about how music is made from scratch from just a feeling in your heart. As a teacher he taught me that every song is subjective to the person creating it and also the person listening to it. As a friend he supported me through my auditions and competitions when I needed an extra hand as I tried making it in the entertainment industry. I feel grateful and blessed to not only work alongside Andre for so many hours, but also to have his support as a friend for such a long time as well. 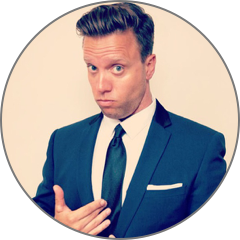 Ward Anderson is an award-winning comedian, author, director, and host of the SiriusXM talk radio program "Ward and Al". He has performed all over the world, for tens of thousands of people, in a career that has spanned almost two decades and across several different platforms. 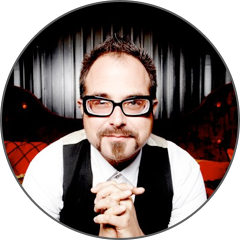 He has appeared on such TV programs as MuchMusic's Video on Trial, Breakfast Television, and numerous other talk shows, as well as on his own stand-up TV special. 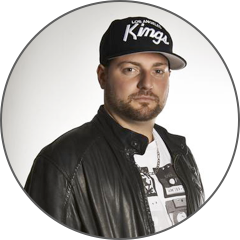 He is also an award-winning commercial and music video director, and a Canadian Comedy Award nominee. Currently, Anderson is one half of the radio talk show "Ward and Al", with comedian Allison Dore. Heard on SiriusXM's "Canada Talks" channel, "Ward and Al" can be heard every Monday through Friday, 10am to 12pm Eastern Standard Time. Anderson's first novel, I'll Be Here All Week, will be released by Kensington Books in spring 2014. SHAYNE’s singing debut was on his first grade stage, when he belted out, in perfect pitch, My Heart Will Go On to a standing ovation. Growing up in Thunder Bay, Shayne trained under celebrated vocal coach Denise Kurceba-Krawczuk, owner of Applauze Productions. At the age of 17, Shayne had the privilege of training with renowned vocal coach Seth Riggs in LA who has worked with Michael Jackson and Steve Wonder. Shayne formalized his musical training by earning a Bachelor of Music in Contemporary Music Studies with a Major in Vocal Studies, at Humber College (Toronto, Ontario, Canada). While at Humber, Shayne recorded his first EP Hollywood Love. Upon graduation in 2013, Shayne landed an internship at LA’s Sunset Sound. At Sunset Sound, Shayne gained a deeper understanding and appreciation for recording and songwriting. At this point, Shayne decided to make Toronto his new home base to further foster his singing and songwriting. During World Pride 2014, Shayne performed his original song No Limits to Love (“a universal anthem for love”), for Statlers’ lineup, on the OLG Central Stage. In the fall of 2014, Shayne trained under Toronto-based Elaine Overholt who coached John Travolta and Michelle Pfeiffer in Hairspray, along with Richard Gere, Catherine Zeta-Jones, Renée Zellweger, and Queen Latifah in Chicago. Shayne performed Saturdays at Yorkville’s Toni Bulloni (November 2015 to February 2016). Shayne released his self-titled debut album, SHAYNE, produced by Andre Mina, April 2016 with a collection of his original songs. LIFT ME UP is the first single. Mark Zubek is a successful musician, producer and composer originally from Toronto. He has worked with Jack DeJohnette, Dave Holland, Kurt Rosenwinkel, Wynton Marsalis and written jingles for companies like Coca-Cola, Dunkin’ Donuts and The Discovery Channel. Mark studied at the Berklee College of Music and lived as a working musician in New York City for 10 years before returning to Canada. In 1998 Mark co-produced the Grammy nominated jazz group, Red Time. Hamza signed with Awakening Records; the British-based Record label and released his debut album “Ehlam Ma’aya” (Dream With Me) in 2008. The album became an instant hit especially with university students, and reached the Top 10 list in Virgin Megastore. In the months following President Mubarak’s resignation after 25 January Revolution, Namira emerged as a major public figure. Aamir Hasan is a visionary and entreprenuer who specializes in developing and establishing brands to attain professional success in the entertainment and real estate industry. 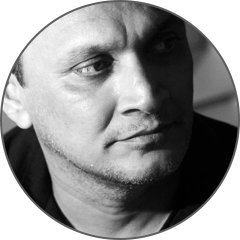 He is best known for his work with South Asian artists and bands such as Junoon, with their multi-platinum selling album “Inquilaab”, Nazia & Zoheb Hasan and Fakhre – Alam (Yatagan). He also worked with Pakistan idols judges Ali Azmat and Hadiqa kayani and a successful real estate investor. Copyright Andre Mina. All Rights Reserved. Developed by Marco Azer.